T hroughout our history we have been driven to solve the mysteries the Universe presents to us. We once thought that we could never go faster than the speed of sound. Then we thought we could not achieve orbit, or pass through the radiation belts and go to the Moon. But all these things we have done in the name of both humanity and exploration, to coax secrets from our Universe little by little. In the Summer of 1969 (which is part of a song if I recall), America landed on the moon with Apollo 11, reaching the apex of a several decades long buildup of technological know how that could successfully deliver a select group of explorers to the Moon and return them home again safely. Conspiracy aside, my personal conviction is that not only did we get to the moon ONCE but returned several more times, culminating with the December 1972 Apollo 17 mission to the moon. Conspiracy theorists discuss this feat of a lifetime as having not happened, saying a grand hoax was perpetrated on the world. Usually this conspiracy is voiced by those who did not live through the buildup of technology over the decades, and who did not have the benefit of experiencing the long trail of trial and error that led humanity to achieve landing on the moon. Making naïve pronouncements of false landings and ignoring an overwhelming mountain of evidence they say its all a lie... and then offer absolutely no proof of their claims. One of the main tenets of the conspiracy holdouts is that the shadows seen in photos taken with the astronauts' own cameras on the lunar surface were somehow wrong. The claim is that the shadows move in different directions as if multiple light sources are illuminating the scene. This claim. called the "shadow conspiracy," is supposed to be the indictment of those who would fool us with a movie set and a studio setup. My company creates visual effects for movies and television and I can say that we can create a very realistic Lunar surface but anyone involved in such fakery would have undoubtedly said, "Hey guys, I don't think we should be using two lights here..." No one thinks to give the visual effects artist credit for having likely said that... Its really annoying. We worked on stories for Seasons 1-3 so far of NASA's Unexplained Files, and in season 2 we were given the Lunar Landing Conspiracy story to investigate. There were several approaches to the story and we considered it low hanging fruit. We attacked that "shadow conspiracy" with a vengeance. 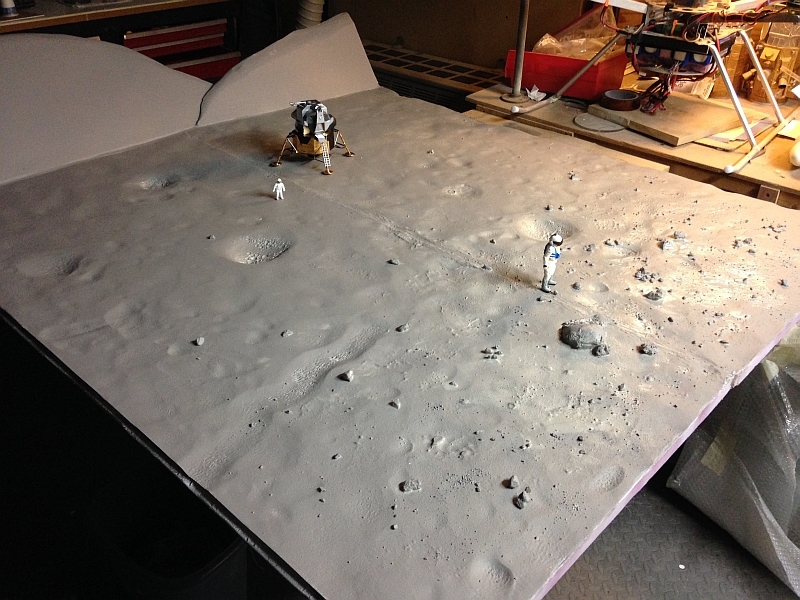 First, we created a Moon set complete with astronauts and a lunar module. Figure 1 below shows the set. It was forced perspective such that objects closer to the camera were more detailed and less detailed further away from the camera's perspective. There were craters and rocks as is evident. These are crucial to the understanding of the misguided tenets of the shadow conspiracy as will be seen shortly. After creating the set we then we lit it with ONE bright studio light far away to approximate the Sun. 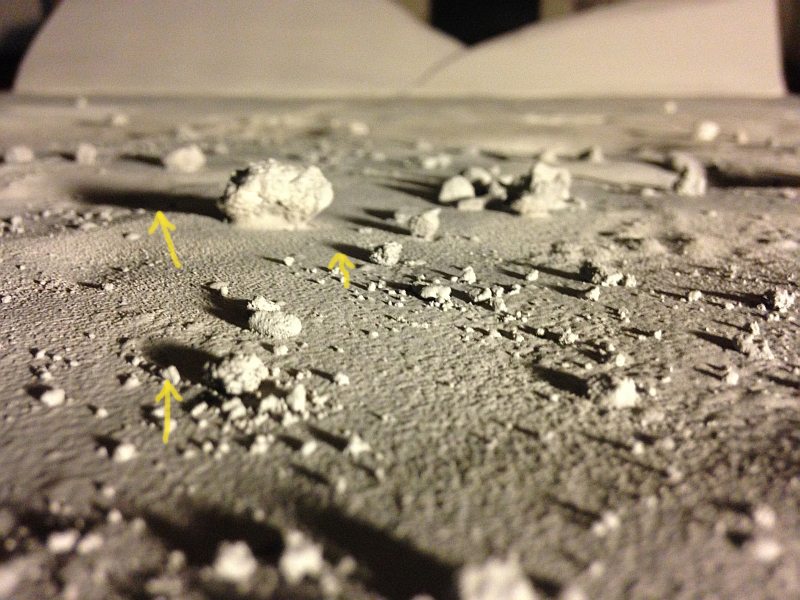 Figure 2 shows the effect of a low angle camera similar to those used by astronauts on the Moon... The yellow arrows point to the shadows that are going the wrong way. But wait! Only ONE light was used to light the set and it was a great distance away How could this happen?! Figure 2: The shadows are going in multiple directions! Oh no! 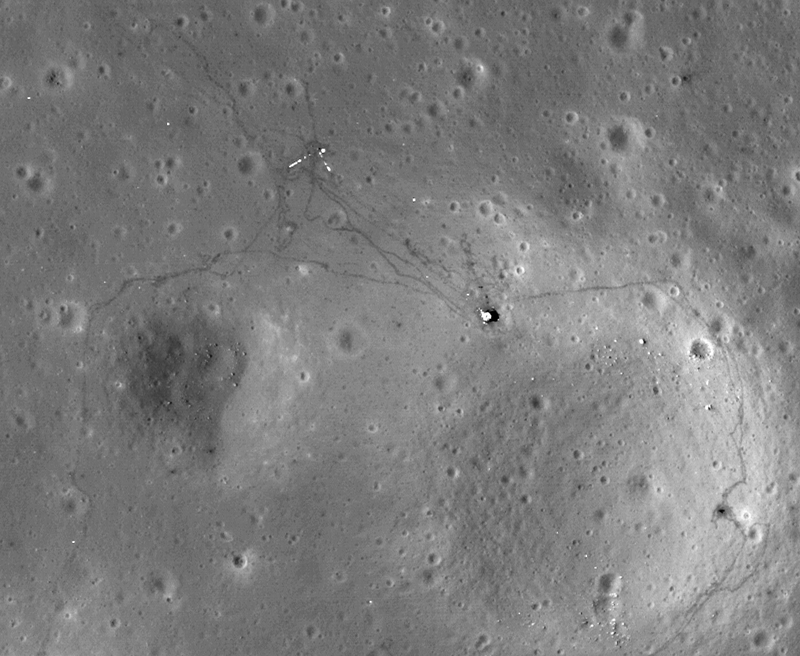 Well this result was exactly as expected: The low angle light traversing the simulated lunar terrain appeared to go in various directions when seen from a low angle simulating the astronauts camera level. 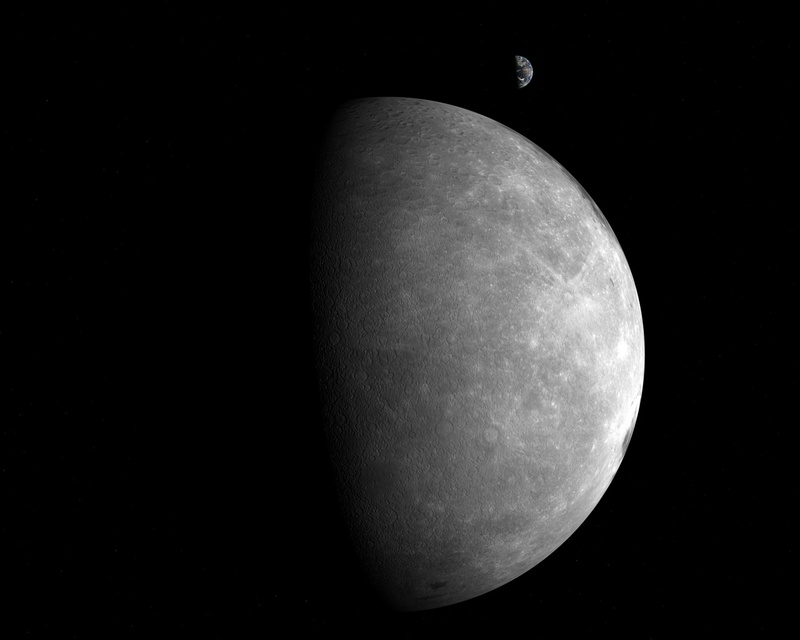 The reason is one of Lunar topology, that is, the fact that the terrain has various gradual slopes and unevenness. Its as simple as that and you cannot argue with the physical model that we created. Those same 'wrong' shadows seen from above told a different story however. When the camera was directly over the scene looking down, all the shadows were perfectly aligned. The shadow conspiracy was dead. Another mainstay in their conspiracy is that there are no stars in the "night" (really daytime) sky on the moon. This, for anyone who knows how cameras work, is an absolute no brainer. To expose the lunar surface properly without it washing out you have to cut the light getting to the camera film which was used at that time. This results in really dark shadows while assuring properly exposed gray lunar regolith (soil). Stars are hopelessly faint in comparison to the lunar surface so quite simply they wont show up because they are vastly UNDER exposed to bring the surface to the proper neutral gray. Yet the conspiracy theorist in a profound display of ignorance will convince him/herself that such vital findings are absolutely unimportant and rage on with their own lunacy. Yes, its lunacy. Oh and by the way, the word "lunacy" comes from the word lunar, or MOON, and describes the ancient belief at the time that if the light of the moon fell upon you while you were asleep, you would be driven mad. But wait, these conspiracy people DO look at a lot of Lunar imagery... Perhaps there is a lesson there.